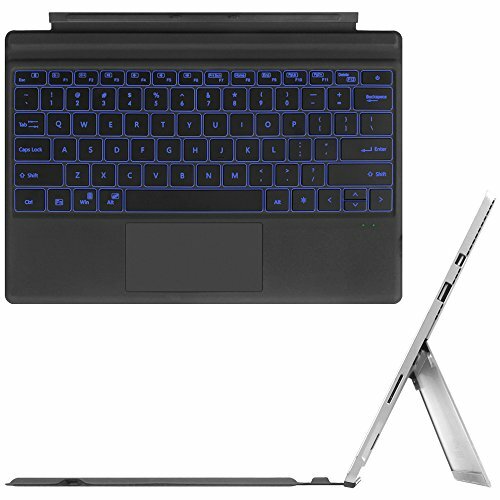 This Backlit Bluetooth Keyboard is designed for Microsoft New Surface Pro 2017, Surface Pro 4, Surface Pro 3. Will not be compatible with the Surface 3 and any other devices. Press "(Light icon)" keys for turning on the backlit. Press "Fn + Esc (Blutooth icon)" keys together for connecting. Press first time is turning on the light. Press second time is increasing brightness. Press third time is lighting off. Press "(Light icon) + Up / Down" keys to change the backlit colors (7 optional colors). When the battery is less than 20%, the backlit will be turnt off. ***The backlit won't work until the keyboard paired with device. Exclusive design for 2017 Newest Microsoft Surface Pro / Surface Pro 4 / Surface Pro 3, with slightly spread out keys for a more familiar and efficient typing experience that feels like a traditional laptop. 7-Color elegant LED backlight with 2 brightness level, ideal for typing freely even in low light conditions or at night. Keyboard will automatically turn itself on and off upon opening and closing. *** The Surface Pro tablets themselves don't feature an auto sleep/wake function, so you will need to use your tablet's power button to turn the screen off. Built-in 750mAh rechargeable lithium battery provides about 200 hours of effective usage time without backlit, extra long standby time up to 90 days per full charge. Wireless Bluetooth 3.0 technology that provides high speed connection and signal distance up to 33ft/10m. Built-in two-button trackpad gives you the touch screen experience, without having to take your hands off the keyboard. The split keys and scissors switches will make your typing as comfortable as that on a laptop. *** The touchpad may not work properly if the keyboard is on an uneven surface. Slim and Lightweight - Compact size (13.98 * 0.98 * 9.84in) and light weight (17.9oz) allows easily be carried and packed in backpack, message bag or case.